Dimensions 1 by 9.50 by 11.25 in. 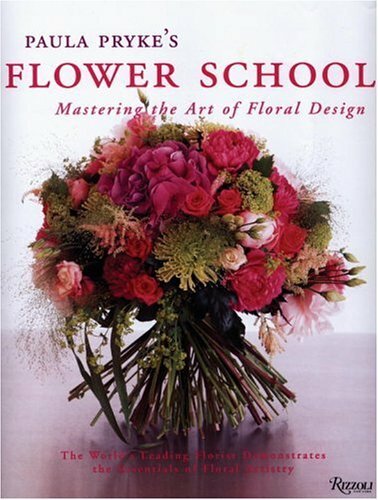 The essentials of the author's flower school program in London are offered in an illustrated guide that features step-by-step instructions, clearly defined photographs, original ideas, and invaluable techniques for flower arrangers of any skill level. 15,000 first printing. Amazon.com description: Product Description: Paula Pryke is one of the world's leading floral designers and an inspiration to novices and experts alike. Her flower school in London, which attracts students worldwide, provides one of the most sought-after credentials for anyone serious about mastering the art of floral design. Now with Flower School, Pryke offers the essentials of her London program in gorgeously illustrated text, allowing readers to feel as if they have enrolled in her school. Simple step-by-step instructions and clearly defined photographs make even the most ambitious design achievable. Drawing on her signature designs, she discusses design rules, color concepts, equipment, and flower preparation, and then offers a series of formal lessons on hand-tied bouquets, the use of water in containers, wirework, and designing for special events. This impressive collection is rounded out with a flower directory detailing those flowers and plants best suited to Pryke's dramatic approach to floral artistry. Packed with original ideas and invaluable techniques, this comprehensive volume is an inspirational sourcebook for flower arrangers of any level. About: The essentials of the author's flower school program in London are offered in an illustrated guide that features step-by-step instructions, clearly defined photographs, original ideas, and techniques for flower arrangers of any skill level.